If you have any questions regarding Teacher Constitutional Rights , please contact us for a FREE TEACHER RIGHTS CONSULTATION. Two of the more important Constitutional protections for teachers and school staff are the rights of free speech and due process. Other rights include freedom of religion, freedom from search and seizure, freedom from self-incrimination, and certain privacy rights. 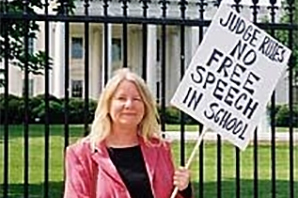 Teacher and School Staff Free Speech. A person does not give up his or her right to free speech as a result of becoming a public employee. Free speech encompasses a number of different areas, each with its own specific rules. These include academic freedom, artistic expression, the rights of association (such as with a union), and political speech. One thing that is clear is that educational employees may not be dismissed, transferred, reprimanded, or have their employment rights infringed in any way as a result of exercising constitutionally protected rights of free speech. This applies to probationary as well as non-probationary employees. The analysis for determining whether free speech rights have been violated requires a number of steps. Much will depend upon the unique facts, which exist. However, it is important to remember that a person must prove with evidence that his or her rights have been violated. Mere “belief” is not sufficient. The first step in this analysis is to do determine whether “protected speech” is involved. Speech is considered to be protected whether it is made publicly (by letters to the editor, speeches to the public, comments at school board meetings) or privately, such as to an immediate supervisor. However, the subject of the speech is important. Only matters of public concern rather than private concern are protected. If, for example an employee airs personal grievances against a supervisor that pertain solely to his or her individual situation, these are not protected speech. Educational policy, expenditures of public funds, and board positions on collective bargaining would all be issues of public concern. The next step in analysis is whether the employee’s interest in commenting on matters of public concern outweighs the employer’s interest in promoting efficiency and integrity in discharging official duties. There are a number of factors, which will be considered in weighing the respective rights. 4. The need to encourage a close and personal relationship between the employee and superiors. The more disruptive the speech, the less likely it is to be protected. Similarity, the closer the personal contact, such as between a principal and a superintendent or a secretary and his/her immediate supervisor, the less likely it is to be protected. A board policy directing employees to “go through channels” will not automatically preclude an employee from making a direct appeal to the board of education or board members. Once again, the court will examine how disruptive such direct contact is to the efficient operation of the educational employer. After overcoming the “protected speech” requirement, an employee must prove that the exercise of the protected speech was a substantial or motivating factor in the decision of the board to take some adverse employment action against him or her. This is an issue of fact, which must be supported by proof. If the employee is successful in proving that his/her speech was constitutionally protected and that it was a substantial or motivating factor in the employer’s action, the employer is then given the opportunity to prove that it would have reached the same employment decision even in the absence of protected conduct. The theory, as expressed by the courts, is that an employee should not be placed in a better position just because he or she exercised rights of free speech. Similarly, an employer would not be prohibited from disciplining an employee if it would have done so even if no free speech issue were involved. Furthermore, if an employer, after a good faith investigation, reasonably concludes that the employee’s speech was not a matter of public concern and takes action against the employee because of it, the employer’s conduct will not be improper even though it is later determined that the employee’s speech was constitutionally protected. Once again, this will be an issue of fact. If the employee is successful in meeting his or her burdens of proof, appropriate relief can include injunctive relief, reinstatement to a job or position, damages as proven, and attorney fees. Teacher and School Staff Due Process. Public employees, including educational employees, may not be denied property or liberty rights without due process of law. Liberty rights include things such as a person’s reputation (i.e., being accused of acts damaging to a person’s reputation). Property rights include the right to a job. In order for an employee to have a property right in the job, there must be a reasonable expectation of continued employment. This expectation of continued employment would be based upon state law (such as tenure statutes), an employment contract, a just case provision in a collective bargaining agreement, or some school board policy guaranteeing continued employment or permanent employment status. Just because an employee believes he/she will continue to be employed is not sufficient. The amount of process, which is due, varies considerably from situation to situation. It does not necessarily require all the rights normally given in a court proceeding. The more serious the penalty (i.e., discharge), the more “process” that is required. If property or liberty right is involved, the minimum process required appears to be a notice of the charges, a discussion of the proof against the employee, and some opportunity to respond. If you feel that one of your Teacher Constitutional Rights has been violated, please contact us for a FREE TEACHER RIGHTS CONSULTATION.